Call is sharp “pik.” Drumming increases in tempo towards the end. 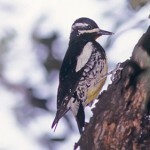 Description: Yellow cap; black head with white facial markings; black-and-white barred back; black wings, rump,and tail; and white underparts with black barring on the flanks. Female is similar but lacks yellow cap. 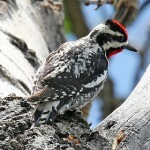 Behavior: Less active than other woodpeckers; will spend minutes at a time in one spot. 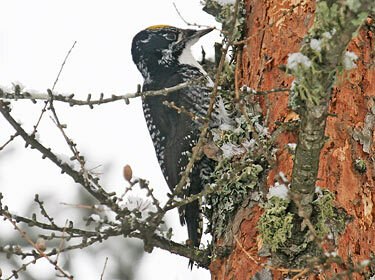 Habitat: Often found in burned-over stands of coniferous forests. Where in Nebraska: Accidental. Single specimen record from Scotts Bluff County in 1916, and several unreliable sightings. 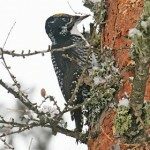 Fun Facts: Most woodpeckers have four toes but the Three-toed Woodpecker and the Black-backed Woodpecker both have only three toes, possibly to deliver more force when drilling.